Whether you’re new to hunting with a bow and arrow or you’re just looking for something new to take out to hunt with, you’ve probably heard about the Martin Saber Takedown Recurve Bow. It’s one of the most popular recurve bows around and for good reason! Martin ﻿﻿Archery has been making top-notch recurve bows for years and this one is no exception. Not only that but it’s reasonably priced and includes some of the brands best features. Before we get into our in-depth review, let’s take a look at some of the specs. The Martin Saber Takedown Recurve Bow is available in draw weights of 30, 35, 40, 45, 50, and 55 pounds. AMO length is 64”. The brace height is 6.75” to 7.5” and it weighs about 3.5 pounds. It’s only available in a right-handed model. Now, let’s take a closer look at the Martin Saber Takedown Recurve Bow, piece by piece. The riser is the middle part of the bow. A lot of key elements are contained on the riser, including the grip, arrow shelf, and sight. Plus, you can add some other accessories there, too. While most recurve bows have risers that are made of wood, the riser on the Martin Saber Takedown Recurve Bow is made of aluminum. This is a great choice because aluminum is extremely durable while also being lightweight. It has a nice solid feel to it, too, so you know you’re holding something substantial even though the total weight is around 3.5 pounds. It was designed to last for a long time and, quite frankly, the riser is easily the best part of this bow. Martin’s has a special technology called Vibration Vortex V.E.M.s. These are 2 hubs that are mounted in the riser. They’re designed to improve accuracy while decreasing sound and vibration. Basically, they make it a lot more enjoyable to shoot with this bow. You’re more likely to hit your target and you won’t feel it as much in your hand when you shoot. Plus, it’s quieter, making it a great bow to take hunting because you won’t scare off your prey. 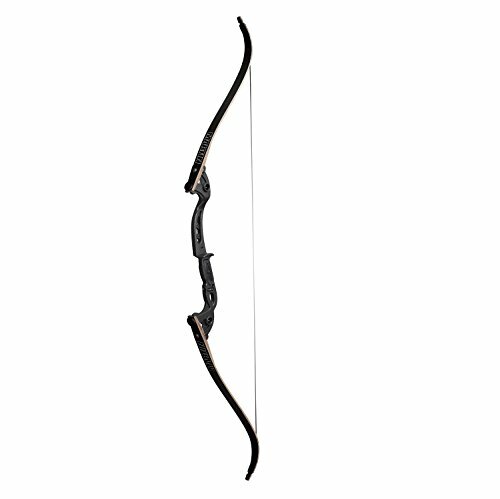 When you buy this recurve bow an arrow rest is included. It’s not the best quality and moves a little when you’re shooting. Plus, because it’s made out of rubber, it will definitely wear down over time. This is a bit disappointing since you’re attaching it to such an awesome riser. It’s an okay one to start with but you’ll probably want to upgrade to a metal one after you get a feel for the box or archery in general. Grip is so important because the hand you’re using to hold onto the riser takes a lot of abuse! That’s why Martin uses something called a Thermal Elite Grip on the Saber Takedown Recurve bow. It’s surprisingly complex! For starters, it has a textured rubber part to it on either side while the front and back feel like leather. It’s the best of both worlds, really. Thanks to the texture, the rubber part is easy to hold on to, even if your hands are a little sweaty. The leather-like front and back are really comfortable to hold onto. Overall, it’s ergonomic and a good choice for someone who likes to use their bow for long periods of time. Your hand won’t get sore and your aim won’t suffer. The top and bottom of the bow are called the limbs. They attach to each end of the riser and are where the energy to shoot the ﻿arrow﻿ is stored. These are the parts that bend when you pull back the string. The limbs of the Martin Saber Takedown Recurve Bow are made of layers of wood and glass that have been laminated together. This makes them really durable, especially because the laminating process prevents any bends or deformities from developing. The bow gets the “Takedown” part of its name because the limbs are easy to remove for easy storage and transport. Just unscrew 2 screws and you’re done. Because this is such a long bow, being able to easily take it apart and store it makes it a lot more convenient to use. This recurve bow is generally pretty easy to put together. The limbs easily attach to the riser using a screw and an Allen key that comes with it. It’s not necessarily fast to assemble, especially your first time. Much like anything involving a screw and an Allen key, it might take you a few minutes to get the feel of it, but it’s not what we’d call difficult. Once assembled, this is one of the longest recurve bows available. It’s 64” which is a great length for a beginner because it’s a little more forgiving of mistakes. Now that you know all the technical features of what the Martin Saber Takedown Bow one of the most popular out there, let’s take a look at some great miscellaneous features that make this effective and affordable bow even more awesome. First of all, we haven’t mentioned that this bow is super awesome to look at. It’s aggressive but sleek design make it look like a fine piece of weaponry. Because of the ergonomic design of the grip, this bow is comfortable to hold and will serve you well even in cold weather. While it comes with string, it’s not the best. You’ll probably want to replace it with something of a little higher quality once you get a feel for the bow. You can also modify this one slightly by adding a sight, rest, and quiver. Now that you know more about the Martin Saber Takedown Recurve Bow, you can see why it’s consistently given great reviews. Whether you’re new to the sport or have been shooting a bow and arrow for your whole life, you should consider taking this bow along on your next hunting trip or even just for your next visit to the archery range. If you're not interested in the Jaguar Elite, recuve bow, maybe you'd be interested in our summary of the best Martin Archery Recurve Bows?